Our pistons are manufactured exclusively from premium quality extruded aerospace 4032 & 2618 aluminum alloy. These materials provide a far superior product over OEM pistons by utilizing the vast knowledge that our supplier has acquired through their continuous research and development of unique materials, piston design and technologies. High strength lightweight aluminum forgings. Fully CNC machined and balanced to +/- 1 gram. Our forgings are designed to minimize friction and reduce weight without compromising strength. This design enables the use of a shorter pin for added strength and weight savings. The domes require no de-burring or preparation and feature smooth flowing radii for excellent flame travel. Wrist Pins are included at no extra cost. - Valve pockets can be machined to accept oversized valves. 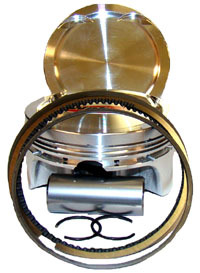 Designed to directly replace the OEM MPE-850 pistons. They fit into the original bore diameter without any modifications. The rings are compatible with Nicasil & Cast iron sleeves.